True story: stripes make me happy. Today is all about my favorite patterns to mix: stripes and leopards. How can two things that seem so different be so right together?! I snagged this dress on sale, but it has gone on even more sale (40% off!) so make sure you grab it while it's hot! I love how effortless it is - I toss it on and instantly feel put together. My shoes and earrings are the only real accessories I need. I love easy dressing, put your hand up if you're with me! and what would a photo shoot be without a not-so-surprise guest? You can find everything below! Ok, I feel you 100% on that because stripes make me happy too! I could seriously rock stripes every day and never get sick of them. And LOVE stripes paired with leopard or floral. SO fun! This dress is amazing, I love the dropped waist! 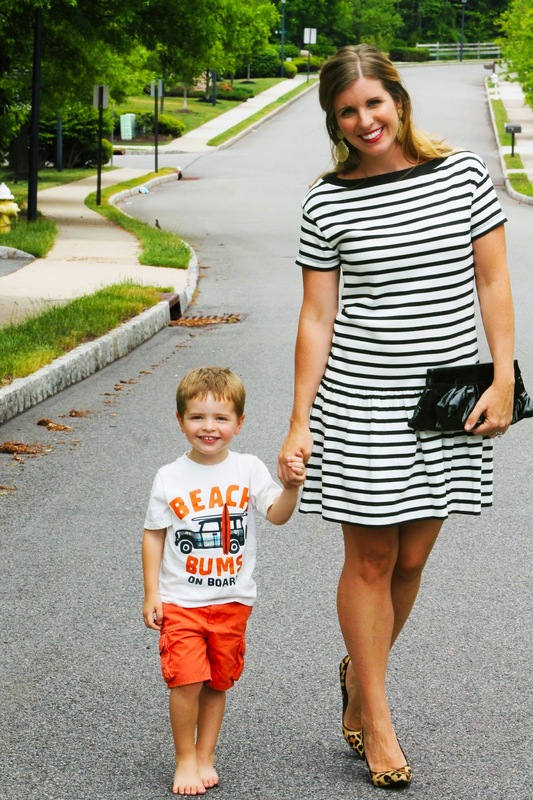 I love stripes and leopard too - such a great combo and that dress is ADORABLE! So cute! I love the dress and the fact that you paired it with the leopard print heels. I love this look on everyone else but have never tried it. Mainly, I think it's because I know one of my 60+ year old male coworkers would make a funny face (or 5) when they saw the combo haha. They'll never learn! Love your surprise guest - he's a natural! ;) Also this dress, I NEED! Wish they had my size! !